Smartphone cameras are getting better all the time, but one thing they’re still not great at is zooming in, usually not letting you zoom far or degrading the quality of your shots when you do. 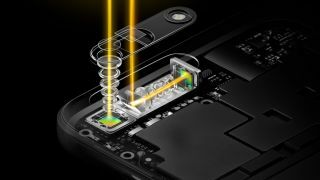 But Oppo has used Mobile World Congress 2017 to announce a new camera tech that could solve that problem. Catchily called “5x Dual Camera Zoom”, this new technology apparently offers 5x lossless zoom – so you can zoom in five times closer to your subject without losing any visible image quality. Most current smartphone cameras top out at 2x lossless zoom, if they offer any at all, so this is a big jump. It works by combining wide-angle and telephoto lenses in a periscope-style structure, giving the lenses more space for a deep zoom, without them sticking out the back of the phone, as you can sort of see in the image above. In fact, Oppo’s solution is apparently 10% thinner than a typical 2x optical zoom, so it can be implemented into a smartphone without adding too much bulk, and it’s accompanied by a new optical image stabilization (OIS) solution that’s supposedly 40% better than OIS on other smartphone zoom lenses, so shots stay crisp and clear even when fully zoomed in. If you want to grab a phone with this new tech, well, you can’t. Not yet anyway, but if it lives up to Oppo’s claims we’d expect to see it start filtering into new handsets over the coming year.